Sol 2256, December 10, 2018, update by MSL scientist Rachel Kronyak: After a successful weekend of activities and driving, we were hopeful that we would wake up on Sol 2256 and be ready for contact science and drilling. Unfortunately, Mars had other plans; similar to Friday’s planning, our workspace turned out to be just as fractured and unsuitable for drilling, so onward we go in search for a drill target elsewhere (again)! Our first two attempts at finding drillable red Jura were unlucky, so this time, we’ll try our luck and head towards a third candidate drill location, called “Region C.” Fingers crossed that the third time’s the charm! 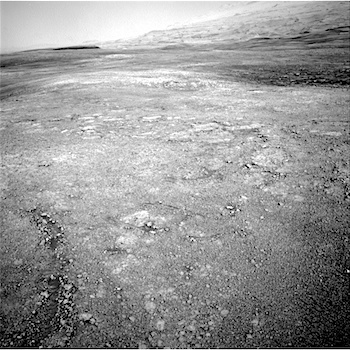 This entry was posted in Reports and tagged Aeolis Mons, Curiosity, Gale Crater, Jura, Mars Science Laboratory, Mount Sharp, MSL, Murray Formation, NASA, Sandy Haven, Tarness Haven, Vera Rubin Ridge. Bookmark the permalink.